Reprint. Originally published: London: Jonathan Cape, 1990. 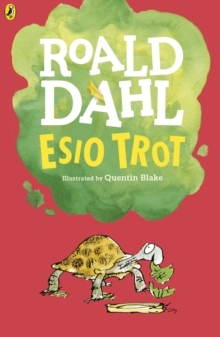 Phizzwhizzing new cover look and branding for the World's NUMBER ONE Storyteller!This is the wonderful and warm-hearted Roald Dahl classic, Esio Trot. Mr Hoppy really loves his neighbour Mrs Silver, and Mrs Silver really loves her tortoise, Alfie. One day Mrs Silver asks Mr Hoppy how to make Alfie grow, and suddenly Mr Hoppy knows the way to win her heart. With the help of a magical spell and some cabbage leaves, can Mr Hoppy be happy at last? 'A true genius . . . Roald Dahl is my hero' - David Walliams And now you can listen to ESIO TROT ( with THE GIRAFFE AND THE PELLY AND ME) and other Roald Dahl audiobooks read by some very famous voices, including Kate Winslet, David Walliams and Steven Fry - plus there are added squelchy soundeffects from Pinewood Studios! And look out for new Roald Dahl apps in the App store and Google Play- including the disgusting TWIT OR MISS! and HOUSE OF TWITS inspired by the revolting Twits.